Back in October I took my family for a trip to California. 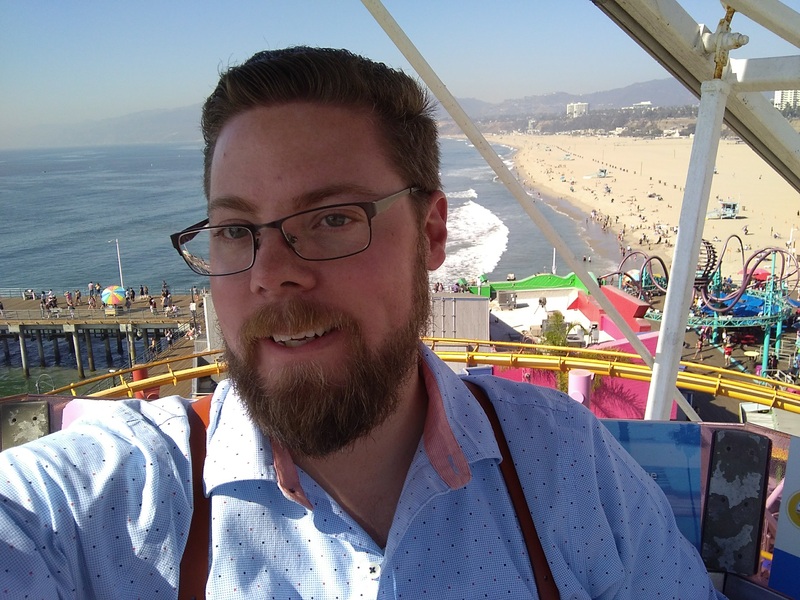 I was getting over the fear of Los Angeles that was beat into me from the media in the 90s (Terminator 2, Reservoir Dogs, Pulp Fiction, Escape from L.A.). I decided that since we lived so close to the ocean now, I'd be remiss if I didn't take my family on the five-hour drive out to see it. After finding the cheapest, least sketchy motel I could justify for my family to stay at we were booked and ready to go. We would go to California and stay in Santa Monica, near the ocean and surrounded by 100 years of architectual and cultural history. While I didn't plan to make the vacation much of a roadtrip, we did find ourselves at a fantastic roadside attraction. We stopped just outside of fabulous Las Vegas for gas and breakfast at Whiskey Pete's in Primm, where we found Bonnie and Clyde's car! It was eerie seeing the bullet riddled 1934 Ford parked in a glass box, but so exciting to be able to get so close to the shady and colorful history that surrounds the Southwest USA. Fortunately our kids didn't find it spooky, but they did like seeing the old car. California bound! We stopped at IHOP in Primm for breakfast and look what we found. Yup. That's Bonny and Clyde's car. After an uneventful drive (other than typical California traffic) we were greeted with the expansive exposition that is the Pacific coast. I was in awe of the serene tension that I felt being at the edge of the contiguous United States. On one hand the ocean is beautiful with it's predictable ebb and flow, the cool breeze coming from miles offshore, and the aura that comes from the pleasant humidity and aroma of the inter-tidal zone. On the other hand it is an endless and unforgiving theater of temperamental weather and volatile solemnity. I could sit and stare at it for hours (provided I had some chips and a margarita). We let the kids splash in the surf while we relaxed and enjoyed being out of the car. We had chosen the Santa Monica state beach to start at, mostly because it was convenient to get to and we wanted to walk a bit. Since it was only Friday morning, the beach was pretty barren. After the kids got sufficiently wet thanks to their inexperience with waves on a natural beach, we put some dry clothes on them and headed up the path to the real star of the day: the Santa Monica Pier. The Santa Monica Pier was amazing. It was beautiful, historic, fun, and full of activity. One of the first buildings on the pier immediately caught my wife's attention. It is the home to their carousel, which was built in the 1920s and housed in the building since 1947. The whole experience inside of there is reminiscent of those times. From the music to the hand-painted murals to the soda fountain inside, it was easily the best part of the pier for my wife and daughter. They love history, and especially love carousels. It sure didn't hurt that the carousel only cost $2 for a ride, either. Further down the pier, we found our way through the arcade and to the rides. We knew we wanted to go on two rides, the West Coaster and the Ferris Wheel. Both because of their iconic nature, and because the price was pretty high for four tickets to each attraction. Fortunately for us the lines were small and the staff was super friendly and accomodating. 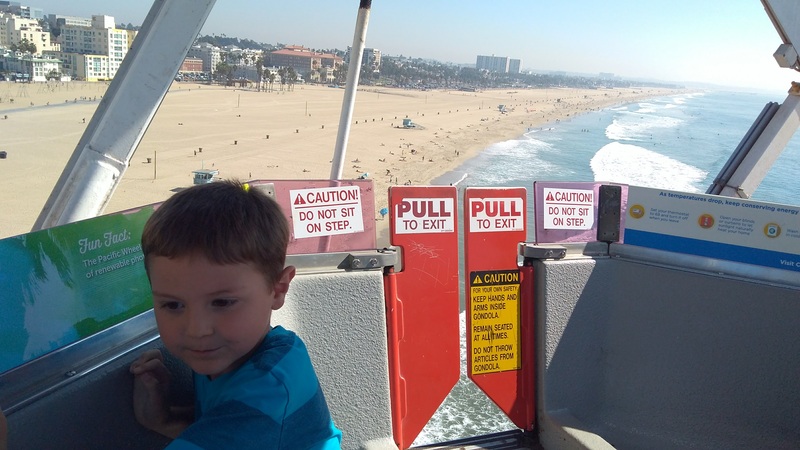 The rides were buckets of fun and the views from atop the Ferris Wheel were well worth the cost. After a bit of poking around on the pier watching fisherman, public performers, and shopping at all the gift shops we stopped for a late lunch at Marisol's. 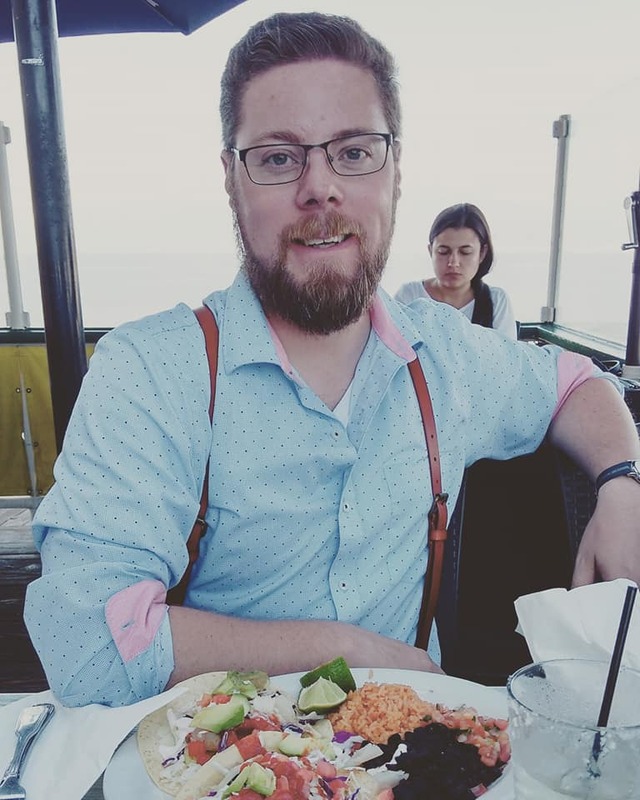 I expected to have to pay a premium to be eating on top of the ocean with an amazing beach view, but the prices weren't much more than the Mexican restaurants in Las Vegas. The atmosphere alone won me over, but the food was exactly what we wanted and the fish tacos were the perfect blend of spicy and sweet, too. On our way off the pier, we decided to stop by the aquarium that is housed just underneath the boardwalk. The aquarium was a fantastic place for the kids to learn about the animals on the Pacific coast, and about conservation. It is mostly run by volunteers, who were happy to show all of the fish and sharks to the kids. The kids even got to feed the starfish. 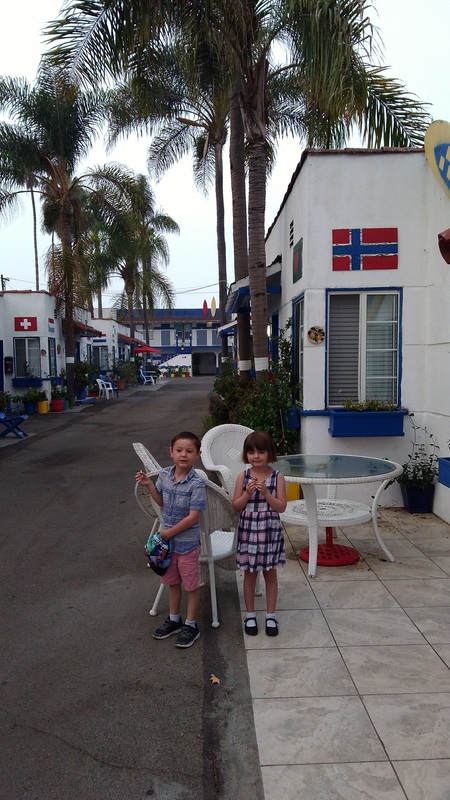 The early morning start and the excitement of the day finally began to weigh on our little travelers, so we decided to check in to the motel. We headed for the Palm Motel where we had reservations. While the staff was a bit curt, the accomodations were delightfully vintage and beach-inspired. The whole motel was a nice sanctuary from the surrounding neighborhood traffic. Although we had planned on dinner at the docks, the comfort of the motel disrupted our decision-making process. We ordered a pizza, put on some cartoons for the kids, then sat out on our patio to watch the sunset through the palm trees.